The 7E Chronicles, sponsored by Gaia GPS (sign up here with a discount). Some camo gear provided by Under Armour Ridge Reaper (shop here on Amazon ). Part 2 of a 3 part subseries of the 7E Chronicles dealing with the gear I'll be using this October during my bull elk hunt. This edition will focus on my firearm and optics. Last time I wrote about the basic necessities I'll carry, and the final part will discuss my camo clothing. One of the very first things that crossed my mind is whether my gun will be sufficient for elk hunting. I've had a Savage Hunter 110 in .270 Winchester since my early teens. It was a gift from my grandfather and my first rifle (even the .22 came after that). I've used it almost yearly hunting whitetail in Virginia. With it, I've taken down deer from 300 yards across a clear cut; from 25 yards across a pond, and anywhere in between. Honestly, I rarely shoot it because it's accurate enough that I've made one-shot kills in almost every hunt...and because the gun lives in Virginia and I live in Arizona. It's definitely enough gun to take down a whitetail; but an elk? I was worried...so was my grandpa, and everyone else I told I was going to hunt bull elk with a .270. So I did what anyone with a question does in 2018--I googled it. At first, I mostly saw critical articles and posts, suggesting a .270 isn't enough gun. But after weeding through I saw some articles from Outdoor Life and Field & Stream listing it as one of the best elk calibers you can use. I decided to listen to the pros at the magazines and stick with what I know. Most of my hunting acquaintances have still been skeptical of the .270, saying "well, I guess if you get a clean shot it'll work"...which is the most obvious observation possible since it'd be unethical to take anything less than a clean shot. Since my only rifle experience is with the .270 on whitetail deer, here's Field & Stream's take on the 12 best elk calibers available. The plan at first was to fly back to Virginia this summer to coincide with some hot bass fishing, but then I started a new job--resetting my vacation time, started a house hunt, and just generally got busy. Then I thought I'd have it shipped out as freight, but the cost of doing that then getting it back to Virginia to deer hunt was irrational. So I broke down and upgraded my 20+ year old Savage to a brand new Savage Hunter .270 with the accufit, accustock, and accutrigger. It's still waiting for it's first use this weekend, but boy is it a good looking gun. After deciding to buy an Arizona rifle I needed to put a scope on it. Bass Pro pointed me in the direction of Vortex scopes over anything else in its price range. I've heard great things, but I wasn't keen on plunking down $250+tax in addition to the cost of the rifle. After some more Googling, I stumbled on OpticsPlanet.com, which had the Vortex Diamondback 3.5-10x50 for $189, then had a 15% off coupon, no tax, and free basic shipping. I was a little skeptical since I had never heard of that site, but figured it was worth the gamble. Three days after my order the scope landed at my doorstep, 2-7 days earlier than expected. After getting it mounted and bore-sighted at Bass Pro, it's looking great on top of the new Savage. 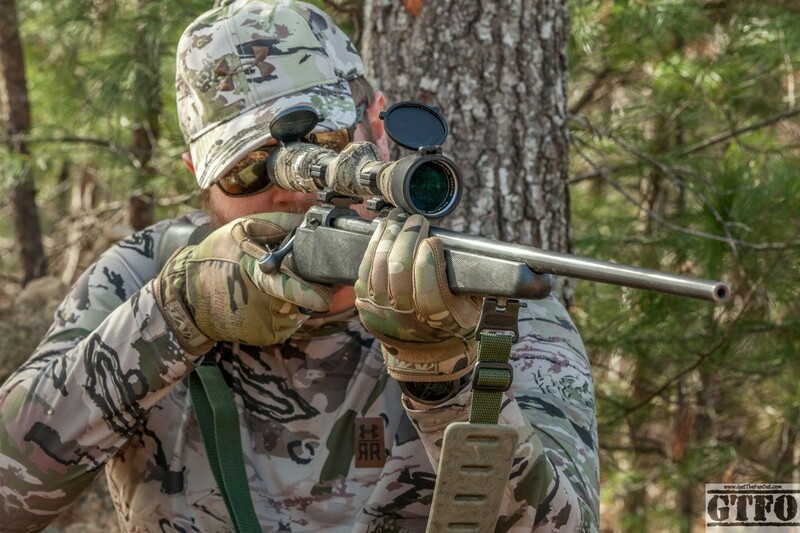 If you're not sold on the Diamondback, here's a guide to selecting a rifle scope for your hunting needs. I remember when I was 11 or 12 my uncle took me to a gun show at the civic center. I was browsing binoculars and mentioned wanting a pair. His response was "if a deer is close enough that you can see it, you should be looking at it through your scope, not binoculars." I took that to heart and eschewed binoculars for the next 20 or so years...until a couple years ago I got a pair of Nikon Aculon binoculars for a Christmas gift. What a difference they made! Picking out a brown deer against dead, brown leaves and deciphering antlers from branches became infinitely easier. For an elk hunt, depending on the terrain, you might need a spotting scope and binoculars, or maybe just binoculars. Since my hunt is going to have narrow ridge-to-ridge distances and a significant amount of tree cover (and because I don't have $500+ for a spotting scope and tripod), I'm just going to use binoculars. If you are going to be hunting open ranges with long distances--and have the cash--then a spotting scope can be a serious help. Bino harness for quick and ready access.